Life is good if youâ€™re Cliff Luster, the publisher of Courier Life Publications whose crown jewel is the Bay News. You already sold your company, which was founded by your father, to News Corporation, owned by Rupert Murdoch. 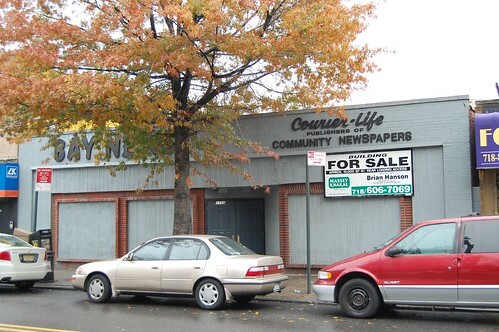 Murdoch also continues to pay you $10,000 a month for rent, insurance, and utilities at the storefront at 1733 Sheepshead Bay Road, according to sources. On Monday, Nov. 19, Massey Knakal Realty Services will announce that the grey building with no windows is on sale for $3.5 million, allowing just enough time to find a potential buyer before News Corporation, the media conglomerate intent on securing a local presence, has its lease expire in the summer. Although $10,000 a month is nothing to scoff at, Luster could be making $30,000 a month for renting the building, according to real estate analysts. Stores on Sheepshead Bay Road can easily demand $30 a square foot per month. I’d state. That is the first time I frequented your website page and so far? I surprised with the analysis you made to create this particular submit extraordinary. Great job!